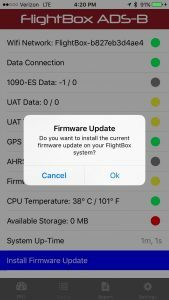 The FlightBox Utility app allows users to easily check the status of their FlightBox and install firmware updates if available. The latest iOS version also provides a Primary Flight Display (PFD) view that emulates a full suite of cockpit instruments. The app is free and was built to work with most modern iOS and Android devices. Review a “plane english” report explaining what your system is doing. To install the app, open the Apple AppStore / Google Play Store app on your device and search for “FlightBox Utility”. Tap the “Install” button. The app will be installed on your device. To launch it, simply tap the icon. Each time you launch the app it will immediately check to see if it has the latest firmware update available. If not, it will download it to your device. The files are generally around 11 MB. The latest version of the application (1.2) will also download the latest beta version and an airports database used by the PFD function of the app. If your device does not have a cellular connection, be sure to open the app while connected to your wifi Internet connection – this allows it to download the update. The download generally takes no more than 2 minutes on most broadband networks. This covers the latest version of the FlightBox Utility app for iOS (1.2). Please make sure your copy is up to date. 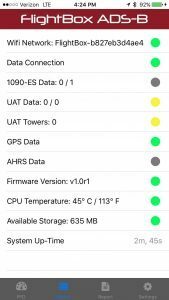 Connect your device to the FlightBox wifi network. Open the FlightBox Utility app. Click OK to dismiss the notification. 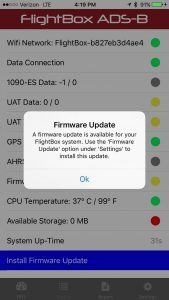 The FlightBox app will check the status of your FlightBox and, if a firmware update is available, display a notification. It will also display a yellow indicator next to the “Firmware Version” item in the Status page. Tap the “Settings” option at the bottom of the screen. Tap the “Firmware Update” option. If the navigation icons at the bottom of the page are grayed out you are most likely not connected to the FlightBox. If the Firmware Update option is grayed out, you may not have the firmware downloaded to your mobile device. Make sure your device is connected to the Internet and restart (kill and re-launch) the app. It should download the update. Then repeat the above steps. 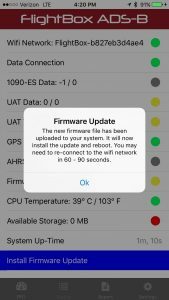 Settings – allows you to change the main application settings and to update the firmware if an update is available. To navigate, simply tap the icon for the option you prefer. 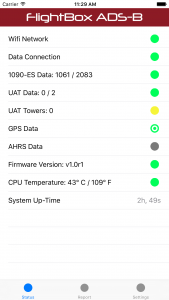 To check the status of your FlightBox, power it up and connect your iOS device to the wifi network then launch the app. 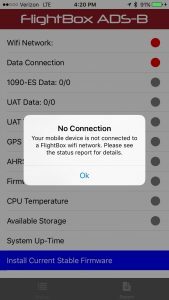 The app checks to make sure that you are connected to a network named either “FlightBox-…” or “stratux”. If you are not, it will show a red indicator next to “Wifi Network”. If you are, it will show a green indicator. The app attempts to establish a data connection with your FlightBox. If it cannot, the “Data Connection” indicator will appear red. If if can, the indicator will appear green. If you have a green “Wifi Network” indicator but a red “Data Connection” indicator, the FlightBox is not running the ADS-B receiver software. Try rebooting the system by unplugging it and plugging it back in again. If your system has an enabled 1090-ES radio module, the app will show the number of messages it has received. If the receiver has not received any 1090-ES messages, the indicator will be gray. If it has received 1090-ES messages, it will be green. The numbers to the right of the colon indicate 1) the number of 1090-ES messages received in the last minute; and 2) the maximum number of 1090-ES messages received since power-up. If your system has an enabled 978 MHz radio module, the app will show the number of messages it has received. If the receiver has not received any UAT messages, the indicator will be gray. If it has received UAT messages, it will be green. The numbers to the right of the colon indicate 1) the number of UAT messages received in the last minute; and 2) the maximum number of 1090-ES messages received since power-up. 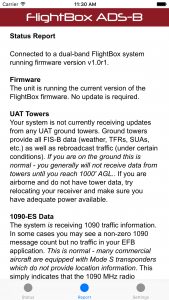 Note that you will generally NOT receive UAT data on the ground unless you happen to be very near a UAT ground tower or an aircraft with an active UAT transmitter. Indicates the status of the GPS receiver on your FlightBox. If your system does not have a GPS receiver the indicator will remain gray. If you have a GPS but do not currently have a lock, the indicator will be gray. If you have a 3D lock the indicator will turn green. If you have a WAAS lock, the indicator will appear as a green “target” as seen above. Not currently used. Will show the status of the AHRS when installed / available. Shows the currently installed firmware version. If an update is available, the indicator will appear yellow. If the firmware is up-to-date, the indicator will appear green. Shows the current temperature of the central processing unit on the FlightBox. If the temperature exceeds the maximum safe value the indicator will appear red. The current temperature is displayed in both centigrade and fahrenheit. Shows the duration of time the system has been operating. The report screen displays a detailed report of the system’s configuration and status. It provides suggestions for any configuration or operational issues it encounters. The report consists of a series of sections, each of which covers a feature or component of the FlightBox system. This is helpful for diagnosing and correcting issues on your own or for working with Open Flight Solutions technical support. OFS Support may ask for a copy of the report or may ask you to provide information from it. The settings screen loads the Settings page from the FlightBox web user interface directly in the app. You can use the standard Menu control to select other pages from the web interface. Generally you will not need to change the values found on this screen. Please do not change the values unless you are familiar with their function. You could accidentally disable a feature. 978 MHz Switch – enables / disables the 978 MHz (UAT) receiver on your FlightBox. GPS Switch – enables / disables the GPS receiver on your FlightBox (if installed). Ping ADS-B Switch – enables / disables support for the Ping EFB receiver (not supported by Open Flight Solutions). Attitude Sensor Switch – enables / disables the accelerometer and gyroscope sensor module on the Open Flight Solutions AHRS module (if installed). This must be turned on for AHRS functionality to work. Altitude Sensor Switch – enables / disables the barometric (cabin) altitude sensor on the Open Flight Solutions AHRS module (if installed). If you are operating your FlightBox in a pressurized aircraft, turn this switch off, otherwise your EFB application may display cabin rather than pressure or MSL altitude. A set of controls used to enable / disable various diagnostic features of FlightBox. DO NOT ENABLE ANY OF THESE UNLESS REQUESTED TO DO SO BY TECHNICAL SUPPORT. Most of these options cause FlightBox to record log files which can fill up your system’s data card and cause the system to slow down or crash. Please do not enable any of them unless you know what you are doing. Show Traffic Source In Callsign – Debugging tool. Adds an “e” to the beginning of all traffic targets received via 1090-ES, and a “u” to the beginning of all UAT traffic. Verbose Message Log – Not Recommended. Debugging tool. Increases the detail level in log files. Will fill up your log partition and cause the system to slow down if enabled. Please do NOT use this option unless asked to do so by technical support. Record Replay Logs – Not Recommended At This Time. Upcoming feature. Records a detailed log all flights. Requires additional storage (USB flash drive). Record AHRS Logs – Not Recommended. Records detailed debugging and tuning data for the AHRS system. This will fill your log partition in a matter of minutes. Do NOT enable this unless asked to do so by technical support. Set AHRS Sensor Orientation – Allows you to change the orientation (i.e. what is considered “forward” and what is considered “up”) for the AHRS system. Please see the video tutorial on setting orientation for details. G Limits – Allows the user to set limit indicator for negative and positive G forces for the G meter display on the “GPS / AHRS” page of the web interface. 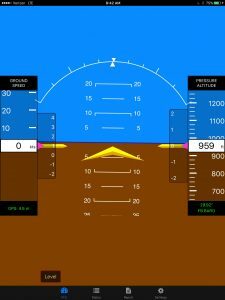 (Note: does not set limits for the G meter on the PFD page of the FlightBox utility.) To set the limit bars at -3 Gs and +6 Gs, you would enter “-3 6” in the box. Mode S Code (Hex) – The ICAO hex code for your aircraft. 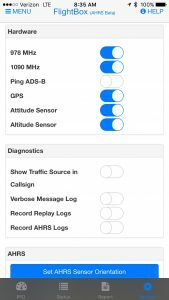 If you have ADS-B Out installed, this is used to filter out your own location reports (aka “ownship” traffic updates) which can help reduce ghosting. US users: you can find the hex code for your aircraft here. Enter your N number and then use the value in the field labeled “Mode S Code (base 16 / hex)“. Watch List – Used to display weather data for specific METAR stations. Enter the ICAO codes (in the US, the KXXX designations) for airports that you want to monitor. The data will appear in the “Weather” tab under the “Watching” section when you receive data related to those airports. Example: “KGPH KMCI KMKC KLXT”. PPM Correction – Not currently used. Do not enter anything in this field. Serial Output Baudrate – Sets the baud rate for serial data output. If you are using our RS232 adapter cable, this field allows you to set the data rate at which it sends. Typically this should be set to either 38400 or 115200 depending on what your EFIS is expecting. Click to select System Update file – not used from within the FlightBox Utility application. This is used to install firmware manually, which must be done from a computer rather than a tablet. For more information, see the video tutorial on installing an update manually. Reboot – forces the FlightBox to reboot. Typically not needed on FlightBox systems – simply disconnect / reconnect the power to reboot. Shutdown – forces the FlightBox to shut down. Not needed on FlightBox. Simply disconnect the power to shut down.